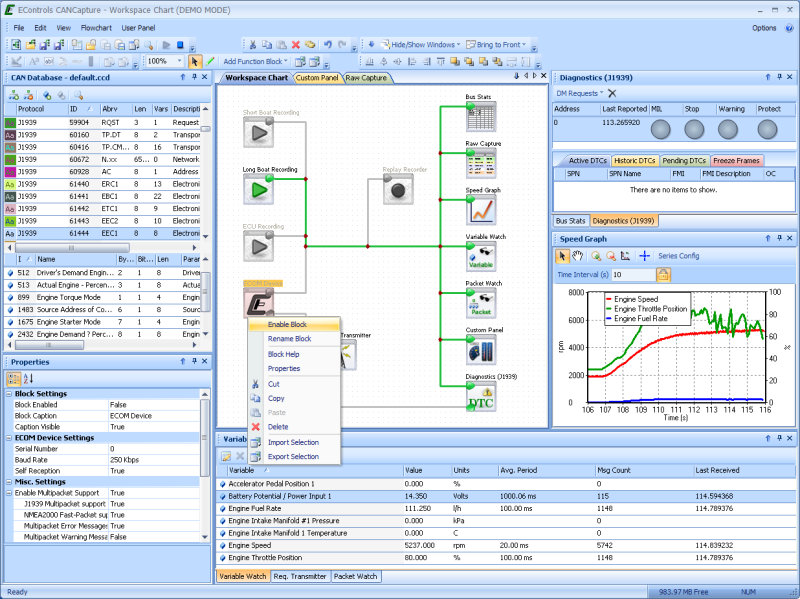 CANCapture is a flexible, powerful and cost-effective software application for capturing and analyzing traffic on a controller area network (CAN) bus. CANCapture was designed with engineers in mind, and during its evolution, it has been continually adapted to fit the needs of all aspects of CAN development. One Unlocked ECOM (USB to CAN hardware interface) device is included with each purchase of CANCapture. Unlocked ECOM devices are not sold separately. Fully customizable data flow management wires up your CAN data however you want. Load and modify the CAN database and connect or disconnect functional blocks without ever having to stop the live capture. Database manager is integrated into the application. Instantly jump to definitions, search the database and add variable watches, graphs, etc. Full J1939 database and support included! No license keys! Install CANCapture on every computer in your organization; there's no longer any need to share a laptop. 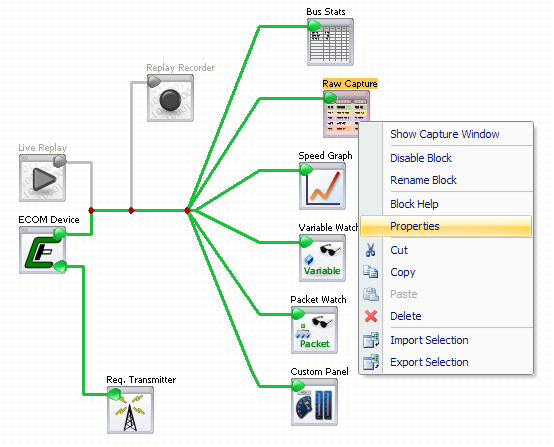 Connect multiple ECOM devices in the CANCapture flow chart to create virtual gateways that can bridge, manipulate, filter and analyze activity between isolated buses. A colorized raw packet list lets you easily visualize and analyze the data on the CAN bus by allowing colors to be assigned to messages in the CAN database. As each packet is received by a Raw Capture block, it gets assigned a color and is displayed and scrolled in real time. Custom scripting allows for everything from end-of-line testing procedures to on-the-fly data encryption/decryption. Implement advanced filters beyond the capabilities of the standard packet filter by using the C/C++ like syntax. Plenty of examples are available. 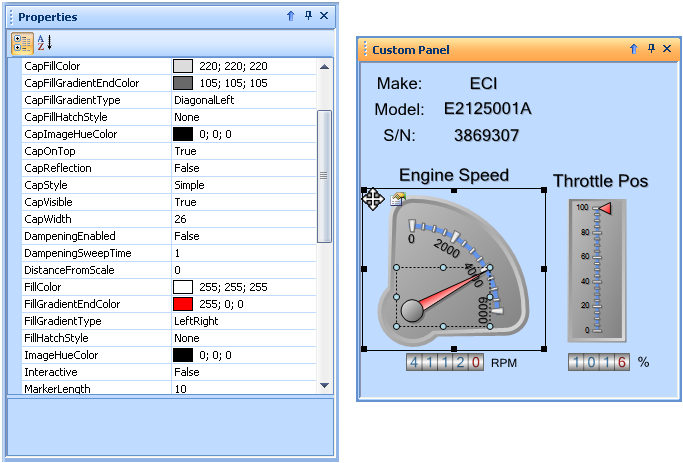 User panels allow real-time display of thousands of variables on sophisticated gauges, sliders, thermometers, numeric indicators, text boxes, etc. J1939 diagnostics block can request and display active/historic/pending diagnostic trouble codes (DTCs) and freeze-frame data. Seamless integration of NMEA-2000 Fast Packet, J1939 multipacket broadcast announce messages (BAM) and destination-specific connection management (CM) messages. Record data in the field and then replay and analyze it later with full or variable speed playback. Let your clients log the data and/or go back and analyze a recorded session with different variables being watched or graphed. Alternately, log data packets or variable watches to Microsoft Excel for in-depth post-analysis. Create standalone EXE files custom built from any CANCapture configuration for distributing to end users and technicians. $1,295 for both hardware and software. Everything you need to get started is included. 30-day money back with a 2-year hardware guarantee - you won't find better value for the price. With the purchase of CANCapture, you obtain total functionality of the product with the complete feature set such as custom scripting, J1939 support, .dbc CAN database importing and professional user panels. STEP Model for ECOM - 3D Step model file for the ECOM cable.